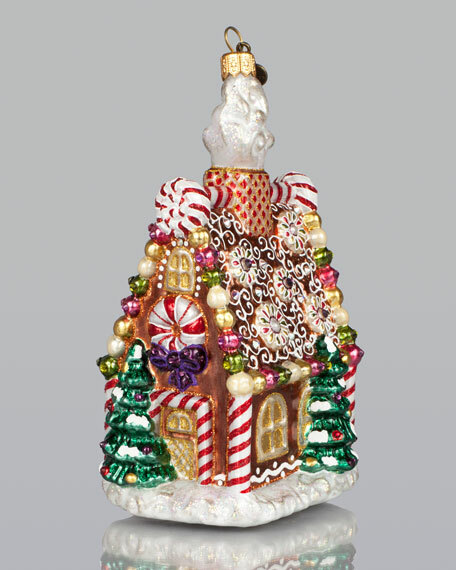 This charming ornament embodies everything we love about gingerbread houses and none of what we don't (the calories). 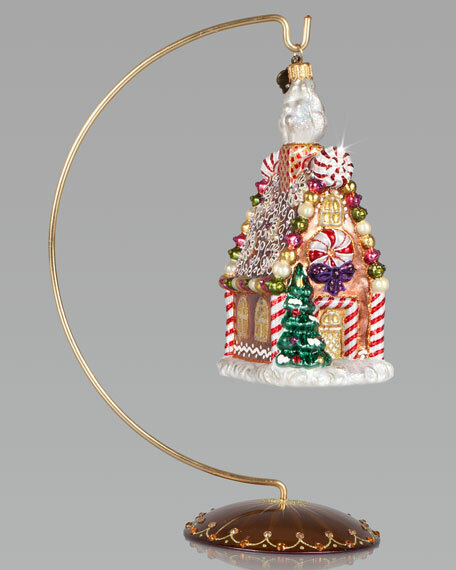 It brings holiday magic to your Christmas tree. Jay Strongwater's love of the elegant but vividly bejeweled objet-whether it's meant to rest on a tabletop or the graceful curve of a woman's neck-has led him on a journey through the worlds of fashion and home furnishings. He began his career while a student at the Rhode Island School of Design. After garnering raves for a necklace he'd made his mother, he took jewelry samples to open buyer days at some of New York's finest department stores, and soon a burgeoning business was born. At the age of 23, Strongwater met designer Oscar de la Renta, with whom he began to collaborate on jewelry designs for runway shows. The move to home accessories was delightfully serendipitous & organic. For the 1994 holiday season, Strongwater sent gifts of jewel-encrusted filigree picture frames to friends, fashion editors, and buyers, who immediately fell in love with the design. By 1998, his Jewels for the Home collection had supplanted his fashion business. In essence, Strongwater created his own niche: the jeweler turning his meticulous eye and art toward a world beyond a woman's wrists, neck, and ears.